Beer and Sausage Cheese Dip - It's Super Bowl Sunday! Although I'm not personally a football nor a tv watcher; I don't live in a cave, and I do know that tomorrow is the 'big game'. Our families favorite NFL team isn't in the championship, but my son is rooting for the Steelers and my husband is rooting for the Cards so either way, I guess we're covered. Here is a 'mans man' dip; beer, sausage and cheese. Because I make 2-3 large pizza's every Saturday evening (and have for over 11 years since I started the 'family movie night' tradition in our home then) I have made more pizza's than I can quickly count. Although pepperoni and green olive is a weekly favorite for one of them, I've made every kind you can think of over the years. One of my oldest daughters favorites is when I turn one of the pizza's into cheesy garlic bread. You really don't need a 'recipe' for this one - just add or delete what you like and use what you have on hand - (the need for cheese and garlic is obvious) but the rest? Do what you like! Bake at 400 degrees for about 18 minutes. Using a pizza cutter, slice across and then into 'sticks' and serve with melted butter flavored with garlic or with pizza sauce to dip. January. A month for making resolutions. I would make a guesstimate to say that most of the resolutions made have to do with weight loss. How that weight is lost is done is going to be vastly different, but everyone seems to want to lose weight. Me? Oh I'd love to lose 10 pounds, but I have zero will power and abhor exercise. As for the whole 'New Years' thing - I don't make resolutions. So, now you know; I didn't resolve to lose weight. I didn't resolve to do anything. LOL. But I do have a product review for those of you that did! Bread. Most of us love it in one form or another but many people making those New Year's resolutions are doing so by cutting breads out of their diets completely. Arnold Bakery is hoping you'll put it back in. The thing is... it tastes good! The true test of course is; 'will my family eat it'. And as you can tell from the half eaten loaf above, they do. It's soft yet easily accepts everything from peanut butter to deli meats. It holds together, isn't too thin, thick or too soft. Yet it's not at all dry or crumbly. It seems to be a perfect blend of ingredients. One of the reasons it's so low calorie is the size. It's not a 'big' bread. Two slices with a filling inside isn't going to fill up a 180 pound guy for lunch, but it's the perfect size for a 'light' lunch for an average guy, coupled with one or two sides (soup, fruit, salad) and for the ladies? Perfect size sandwich for a lunch when you add in that little side salad or a cup of soup. Overall: Thumbs up. High up. RIGHT NOW YOU CAN ENTER TO WIN: How can Arnold Breads help you to reach your health goals? Enter to win (or just get more information) by clicking here. Spinach and Cheese Calzone - It's Not Pizza Hut But I'm Still Trying! Long time readers of mine, friends whom I speak to online about recipes and my real life friends, all know the one recipe that I've been trying to track down for almost 20 years. The year was 1987. I was just turning 17 and worked part time as a sales clerk and cashier. Every Saturday during my lunch hour I would head over to the one fast food restaurant in our tiny town; Pizza Hut. I would order the one and only, most amazing food product that I ever wanted; A 5 Cheese Calizza. They had just launched them as a new product and they were simply incredible. Served in a personal pan pizza pan, they were filled with 5 cheeses and not one drop of red sauce of any kind. Since minimum wage was about $3.25 at the time I had to work over an hour just to pay for my pizza but back in the 80's we were also able to cash 'third party checks' so often I would take my paycheck to the Pizza Hut, order my lunch and sign my check over to them, thereby getting my lunch and cashing my paycheck at the same time. Tonight I emailed the Pizza Hut Corporation and asked them to do a "Bring back the 80's" marketing scheme. They can keep the awful new 'pasta' dishes they are currently offering for their marketing scheme, I don't care for them. But if the could bring back the Calizza I think I'd buy one every other day for the rest of my life! Ha ha ha. So until then I'm ALWAYS looking for new recipes that may come close to the one I loved in 1987 when I was 17. Here is another I'm adding to my collection although I truly am still hoping that Pizza Hut will listen to me and bring back the original! Roll out the dough and cut into circles about 6-8" in diameter or cut into triangles. Mix the first 8 ingredients together. Place a dough circle or square on parchment lined or greased baking sheet and place some of the mixture on half of the dough. Fold over and use a fork to seal or crimp the edges. Brush with a beaten egg white or spray with cooking spray, sprinkle the top with parmesan. Bake at 400 for approximately 20 minutes until golden and cooked through. Serve with marinara or pizza sauce if you like. 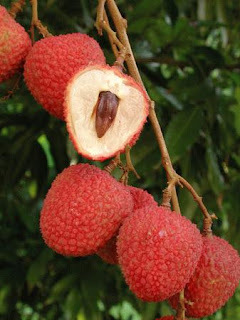 What is a Lychee? And What are You Going to Do With it? This post came about in a weird way. I get a newsletter from a site called My Recipes and their 20 appetizers headline caught my eye. However, once I was at the site I got sidetracked by the word 'grapefuit' and being a nut who loves grapefruit drinks (but hates fresh, real grapefruit) I clicked on it. A click led to a click, led to a click and there I was; staring at a recipe for a grapefruit drink that also used Lychee's. And that reminded me I was going to look up Lychee's about a year ago and find out just what kind of fruit they were, what they tasted and looked like and what you could use them in, when I forgot! So here we are today looking at a picture of Lychee's growing on a tree. They will soon be getting more popular in the United States as they are starting to be grown in Florida and are apparently prolific and dependable. However, since I haven't been blessed enough to live in a warm climate for over decade, I'm forced to buy my Lychee's in a can. And that my dear readers is where todays recipe comes into play; a marriage between grapefruit and Lychee. Enjoy! Drain lychees in a colander over a bowl; reserve 1 cup syrup. Discard remaining liquid. Drop 1 lychee in the bottom of each of 5 glasses; fill each glass halfway with crushed ice. Reserve remaining lychees for another use. Combine reserved 1 cup lychee syrup, juice, and vodka in a large martini shaker filled halfway with ice; shake until well chilled. 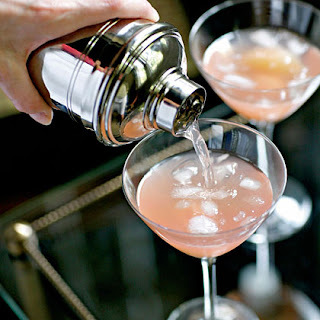 Strain 1/2 cup syrup mixture into each prepared glass; garnish each serving with 1 grapefruit section. Serve immediately. Line cookie sheet with a 1/2 inch edge with foil extending over the sides. Melt butter in a 3 qt. saucepan. Add sugar, syrup, and water. Cook over medium high heat till sugar is dissolved. Clip on a candy thermometer if you have one. Cook over med. heat stirring frequently to 290 degrees or a soft crack stage when tested in water. (Don't be scared of this method - it's the best and it's how I self taught myself to make candies!) Pour into the pan and let set 5 minutes. Sprinkle the chocolate chips over toffee and wait 2 minutes for the chips to melt. Spread over toffee with a rubber scraper or cake decorating knife. Top with nuts and gently press in. Let set to harden. Break into bite-size pieces to serve. Can be stored in an air tight container. *If you are impatient like I am you can put the toffee in the refrigerator or the freezer (which I do). Sometimes the temperature change causes the chocolate to 'bloom' which is just little dots on the chocolate or it has a white cast to it.... if it's just for our family to eat, I don't care! LOL. The payoff is getting to eat this yummy candy faster!! A brine of course is simply a salt water mixture you soak your turkey in to plump it and give it great flavor and keep it moist while roasting. What you add to brine is up to you, but always start with a turkey that NOT self-basting nor Kosher as both already have a mixture in them and if you brine it, it will be too salty to eat. To make the brine, mix 2 cups of (table) salt and about 1 cup of sugar in 2 gallons of water. Make sure that the salt and sugar are completely dissolved before adding the seasonings you like but do not use anything that is salt based! No garlic SALT, onion SALT, celery SALT or Seasoned SALT or anything of the sort. You don't need to add any seasonings to the brine unless you want to. A simple salt/sugar solution is a great basic recipe. However, brines can be spicy with peppers and cayenne, or take on a different flavor with herbs and garlic, or sweet with molasses, honey and brown sugar. Put your turkey into the bucket, cover completely with the brine solution (make more if you need more to completely cover) and place in a cold place - preferably the refrigerator if you can but in a cooler if you don't have room. Those of us in the upper states know that the garage is perfect in the winter months (unfortunately - ha ha). Brrr! After at least 12 hours of brining, remove, rinse and roast as usual! One of the many things I love about cooking and baking is that no matter how old you are how many years you've been cooking, there is always something new to learn! It's so exciting to be a part of something that is ever changing and with the internet we are bringing foods from literally around the globe right into our own kitchens! When I have time (insert a small chuckle here) I love to look up a new food that I had heard of, read about or heard someone mention. If I am reading a novel and see a particular food mentioned that I don't recognize, I love to look it up and find recipes. That's what I did with this one; Kourambiedes. I've never heard of them before, but found it was a Greek cookie. So of course I had to look through a couple Greek cookbooks from the library and online to see what they were. The end result is a recipe like this; compiled from two very similar sources and added to my collection... and yours! In a large bowl, using an electric mixer, beat the butter at high speed until light and fluffy, about 10 minutes. Add the egg yolk, brandy and vanilla and beat until smooth. Whisk the flour with 3/4 cup of the confectioners' sugar, the baking powder, cloves and salt in a large bowl. Add this to the butter mixture in 3 batches, beating at low speed just until smooth. Scrape the dough onto a large sheet of plastic wrap or wax paper and roll into a 2-inch log. Wrap and refrigerate until firm, at least 30 minutes or up to 3 days. Pour confectioners' sugar into a large baggy. Add the warm cookies in batches and gently shake to cover the cookie in confectioners sugar. Transfer the cookies to a sheet of wax paper and let cool. This recipe isn't one that I would make on a Tuesday for a family dinner as there wouldn't be enough time to sufficiently make it. However, for a weekend meal or even company on a week night if you have enough time to prepare it, it's a nice change of pace from the typical beef tenderloin in puff pastry that has been done for the past 30 years. This one came from Food & Wine magazine and I tucked it into my files quite awhile ago. Heat the oil in a large skillet until almost smoking. Add the meat and brown it on all 4 sides over moderately high heat, about 4 minutes per side. Transfer the meat to a plate and season with salt and pepper. Keep the skillet aside without rinsing to use in a minute. In another large skillet, melt 3 tablespoons of the butter. Add the mushrooms and cook over high heat, stirring, until lightly browned, about 15 minutes. Season with salt and pepper. Finely chop the mushrooms in a food processor. Add the crème fraîche and process until combined. Season with salt and pepper. Moisten the rice paper rounds under cool water and lay them on a cutting board until softened. Pat dry with paper towels. On a lightly floured work surface, roll out the puff pastry to a 14-by-12-inch rectangle about 1/8 inch thick. Slightly overlap the rice paper rounds in the center of the pastry. Set the meat on the rice paper rounds and pat the mushroom mixture all over the meat. Wrap the rice papers around the meat to hold the mushrooms in place. Bring the long sides of the puff pastry up and over the meat, then brush the seam with the egg wash and press to seal. Trim off any excess puff pastry from the short sides and brush with the egg wash. Fold the ends to enclose the meat and set the bundle on a lightly greased baking sheet, seam side down. Brush with egg wash. If desired, cut out leaves or other decorations from the pastry scraps and glue them on with egg wash; brush the decorations with egg wash too. Bake for 30 minutes, then cover loosely with foil to prevent the pastry from getting too dark. Continue baking until an instant-read thermometer inserted in the center of the meat registers 120° for rare. Transfer the meat to a cutting board and let rest for 5 minutes. Meanwhile, melt 2 tablespoons of the butter in the skillet used to brown the meat. Add the leek, carrot and shallot and cook over moderately high heat, stirring occasionally, until lightly browned, about 3 minutes. Season with salt and pepper. Add 2/3 cup of the wine and simmer, scraping up the browned juices, until reduced by half, about 5 minutes. Add the remaining 1 cup of wine and the port and simmer over moderate heat until reduced by half again, about 7 minutes. Cut the remaining 6 tablespoons of butter into small pieces. Pour the sauce through a fine sieve into a small saucepan. Set the saucepan over low heat and gradually whisk in the remaining butter. Season with salt and pepper. Carve the meat into thin slices and serve hot; pass the sauce separately. Note: Rice paper is available at Asian groceries and some supermarkets. This morning as I sip my coffee I have a 'few' internet windows open as I surf for Valentine Day gift and food idea's. Looking over my files I saw my copy of this recipe and thought; "Perfect for Valentines Day!" and decided to share. Unlike some of Martha's recipes this one is completely simple and yet beautiful. I'd dip in chocolate for my family but for me? I'd dip the edge in melted white almond bark or maybe some pastel shimmering sugars. I found them online at her website about a year ago. In a heatproof or metal bowl, combine egg whites, sugar, and cream of tartar, and place over the saucepan of simmering water. If you don't have a hand held electric mixer, whisk constantly until sugar is dissolved and whites are warm to the touch, 3 to 3 1/2 minutes and then transfer your mixing bowl to your stand mixer and with the whisk attachment, beat about 5 minutes until high stiff peaks form. If you do have a hand held, you can start on low speed over the simmering water and gradually increasing to high, until soft peaks form, about 5 minutes. Add vanilla and just a few drops of food coloring; beat to combine, and continue beating until stiff peaks form. Fill a piping bag fitted with a 1/2-inch tip with the meringue. Pipe tiny little 1 inch drops onto prepared baking sheet; after each drop is piped by squeezing the bag, release from squeezing, and pull straight up with the bag to create the very fine curled tip on each drop. Bake until drops are hard to the touch but not browned, about 1 1/2 hours. Repeat to use all meringue. Meringue drops may be made a day ahead and kept in an airtight container at room temperature. Melt chocolate in a heat-proof bowl, or the top of a double boiler, set over a pan of simmering water, stirring occasionally. Stir in the oil or shortening until well combined. 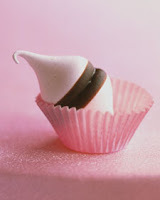 Dip the bottom of each cooled meringue drop into the melted chocolate; stick two together if desired. Turn upside down on a cooling rack, and let chocolate harden -- this can take up to 50 minutes at room temperature -- or just freeze on parchment paper for 5 minutes. Serve. For a person who doesn't care for sweets as much as vegetables, cookies sure do sound good this week! They must to my family too because last night I made a batch and there are only about 12 cookies left from about 45. Ah, teenagers. I'm not a fan of peanut butter cookies in any form, but I my family is, and others are. I tucked this one away in my home files a year or two ago. I've never made it, but the mixture of peanut butter and oatmeal is a good one and I know my husband and kids will eat them! They are supposed to be similar to Girl Scout cookies, although I haven't bought GS cookies for about 4 years and I have no idea what kinds they have anymore. Our family has our own favorites that I'll buy if a GS corners me, but their newer cookies? Haven't a clue. I'm told these taste like theirs though! Preheat oven to 350. In a medium bowl, whisk together the flour, baking powder, baking soda and salt. In a large bowl, cream together butter and peanut butter. Beat in the sugars until fluffy, add the eggs one at a time. Stir in vanilla extract. Blend in the flour and oats. Drop onto parchment lined baking sheets and form into balls about 3/4" large. Bake for about 10 minutes, until cookies are a light golden brown. Cool on baking sheet for 5 minutes while making holes in the tops of half the cookies (to be the tops). Transfer to a wire rack to cool completely. In a large bowl, cream together peanut butter, butter and confectioners' sugar until very smooth. Spread 2-3 teaspoons onto half of the finished cookies and sandwich with the remaining halves. Use the cookies with holes for the tops. I'm kind of laughing at myself as I start to post this one. You see, when I made this last week I just knew it was going to be good so I made sure to snap some photos along the way. We had it for dinner that night and it was a huge hit. My oldest daughter said, "You remember what you did to make this right?" and I replied, "Yep!" So with the help of the photos I'm going to try to walk you through the steps. Since I always say recipes are just 'guides' and you should always play with it to make it your own, this gives you a lot of leeway to play with. *Truly, I'm going off memory here so play with your recipe for more/less or cream cheese and use a little more salt and pepper if you desire. Cook the spinach in a microwave safe bowl while you make the rue. Melt the butter in a saucepan. Cook the onions until translucent but not brown. Add the flour and whisk to cook for 1 minute. Pour in the milk, starting with about 1 1/2 cups. If it gets too thick too fast, add another 1/2 cup. To the spinach add the cream cheese, cut into cubes. Pour the white sauce into the spinach. Season with salt and pepper and a bit of garlic powder (1/4 - 1/2 t) to taste. Place in a greased casserole dish and top with the shredded cheese (although my daughter says you can leave this off as the spinach was awesome without the cheese on top too). I baked this at 350 for about 25 minutes until heated through and the cheese was melted. In the midst of the quiet and cold beyond my kitchen patio doors my mind is actually 1700 miles away... at the beach. With Spring Break coming up in March our oldest daughter was hoping to take a senior trip but with cheering 5 nights a week she's had little time to work at the coffee shop and her finances are low. She decided instead to ask us to move our 'annual' April vacation up to March so she and her friend could go 'with' us but still have their own little senior trip vacation. Brilliant child. Go with Mom and Dad so the gas and food and entertainment is covered! Ha. But in honor of such, I want to give you a recipe that makes me think of the beach every time we make it because we did, indeed, prepare this at our beach resort every year for the first 6 or 7 years we visited. I first started making this quiche back in 1993. I've not made it about 2 years now, but it's still in my Family Favorites recipe book that I keep handy and perhaps it's time to make it again! Heat your oven 425. Sprinkle the shrimp, cheese and onion on the bottom of the pie shell. Beat the eggs. Beat the salt with the whipping cream until thickened but not holding it's shape. 30 seconds is enough. Beat in the eggs and pepper. Pour into the shell. Bake 15 minutes at 425 and then reduce heat to 300. Bake 30 minutes. Remove from oven and let stand 10 minutes to set up. Moving is something we've done quite a bit of in our 20 year marriage. We moved 10 times before we had been married 16 years. In the beginning it was in large metropolitan area's such as Los Angeles, Nashville, Tennessee and Minneapolis, Minnesota and coupled with the fact that we lived in rentals during that time (townhomes, apartments, houses) we were never welcomed by neighbors, but that wasn't suprising. If you have new neighbors in your neighborhood please considering dropping in with a little notecard in which you've written your name and phone number with an offer for them to call with any questions they may have about your new town, as well as a plate of cookies or if you are really so inclined, a hot casserole on the first or second night in the house (along with paper plates and disposible utensils) is greatly appreciated! Break taco shells and place in the bottom of a greased casserole dish. Brown the ground beef or heat the chicken, add the taco seasoning, water, minced onion and tomato sauce. Heat for 5-10 minutes and layer on top of the chips. Top with 1 cup sour cream, layer cheese on top, garnish with tomato wedges and/or green or black olives if desired. Bake at 350 for 15-20 minutes. Serve with salsa. We had this last night to use up leftovers from taco's the night before. I used a mixture of taco flavored shredded chicken mixed with about 1/2 lb. taco meat. The mixture was so very, very good. Because it was already flavored I skipped the taco seasoning and instead, added about 1/2 bottle of homemade taco sauce and 1/2 c water. I would also suggest you can mix in 1 can of refried beans to the meat mixture. It would be delicious! Glancing through my photo files this morning I saw a picture I took one morning of my freshly brewed coffee and 3 mini muffins. It was the little 'spark' that I needed to decide to post a nice muffin recipe on the website for my readers. This muffin is one I love much, much more than the plain old boring blueberry muffins. This one has various fruits and nuts in it with just the right sprinkling of cinnamon to bring it together. You can add/delete depending on your taste (I always say that!) and I hope you play with the recipe to make it 'yours'. Grease muffin cups or use paper liners. Mix the dry ingredients (flour, sugar, cinnamon, baking soda and salt) in a large bowl. Stir in the carrots, apple, coconut, raisins, walnuts and pineapple. In a separate bowl whisk the eggs together with the vanilla and oil. Blend all together just until moist. Do not overbeat. Spoon batter into muffin cups, filling almost to the top. Bake about 35 minutes until done in the center. Cool muffins in the pan for 10 minutes, then turn out onto a wire rack to finish cooling. Serve warm or for even better flavor let them set for at least 12 hours or freeze them for use on another day! Regular readers are probably noticing an overwhelming theme here in the last couple weeks; comfort foods! We've had a blast of arctic air blow through dipping the temperatures down to the -40 windchill temperatures coupled with a string of bad luck when it comes to vehicles and appliance repair. Comfort food is about the only kind of dishes that sound good when the wind is howling at the door, snow is flying, ice is covering everything and you just put a couple thousand dollars in car repairs on the old credit card. In a bowl combine flour, milk, egg and oil along with a touch of salt (about 1/4 t). Whisk until smooth. Slice the onions 1/4 inch thick and separate the rings. Heat about 2 inches of oil/shortening in a deep pan or use a deep fryer. When hot dip the onion rings into the batter and place in the hot oil. Fry a few at a time for 2 - 3 minutes until golden brown. Remove and drain on paper towel. Sprinkle with salt while still hot. Here is a simple dessert I made earlier this week when I wanted to use up about 3 cups of ice cream left in the freezer. My family had no idea what it was (or how easy it was) but it was a huge hit. Soften the ice cream by letting it sit on the counter for 10 minutes. Meanwhile mix the milk and pudding until smooth. Fold or mix in the ice cream until smooth. Place into serving cups and garnish with a graham cracker or vanilla wafer cookie. Because I'm one of 'those Moms' that almost never, ever buy store bought cookies, including Oreos, there is a recipe that my 13 year old daughter has been waiting ever-so-patiently for me to make that involves not only the purchase of Oreos but also Cool Whip... another product not typically found in our home. My poor neglected child wanted me to make it so bad however that she and a friend typed the recipe (simple, only 4 ingredients!) on a piece of paper and she literally taped the recipe to the side of our refrigerator to 'remind' me to buy the products and make it. Well, today is her lucky day! Yesterday while running errands I remembered her request and picked up Oreos and Cool Whip. We already had sweetened condensed milk on hand and of course we had cream cheese... we always have cream cheese. I believe God gave us cream cheese because he He loves us! Ha. Chill or partially freeze and then watch your families eye's light up when you serve it for dessert! *It will be almost as smooth as soft serve ice cream when you first mix it up but will thicken as it sets and chills. Chill for at least 2-3 hours for best results. Peanut butter and cheese and crackers are HUGE in our home. We love them for snacking and even to grab for a quick breakfast sometimes as we run out the door. I always have them on hand and just this past week picked up two packages at the store. That is why, when I saw this recall notice in the news it grabbed my attention and I immediately went to our cupboard to check if I had the brands/styles included in the recall. Thankfully I don't! I bought Ritz brand this time and I'm extremely thankful. Just incase you hadn't heard or read the news here is the notice put out by Kellogs. You'll want to look for their brand as well as the Austin brand crackers and sandwich cookies. The Kellogg Co. announced Wednesday it is recommending that consumers not eat its peanut butter crackers because they may be tainted with salmonella. Salmonella bacteria are transmitted to humans by eating contaminated foods. -- Toasted peanut butter sandwich crackers. -- Peanut butter and jelly sandwich crackers. -- Cheese and peanut butter sandwich crackers. -- Peanut butter-chocolate sandwich crackers. The Michigan-based maker of cereals and snacks posted the recommendation in a statement on its Web site. Peanut butter produced by Peanut Corporation of America, one of several peanut butter suppliers to the company, has been linked to an outbreak of salmonella poisoning that has affected at least 434 people in 43 states, federal health officials said Wednesday. "Kellogg Company's investigation has not indicated any concerns, nor has the company received any consumer illness complaints about these products," the Kellogg statement said. "Nonetheless, Kellogg Company is taking precautionary measures including putting a hold on any inventory in its control, removing product from retail store shelves, and encouraging customers and consumers to hold and not eat these products until regulatory officials complete their investigation of PCA and Kellogg provides further information as to the resolution of this issue." All of the company's peanut-butter crackers are made at its bakery in Cary, North Carolina, said spokeswoman Kris Charles. Though consumers are urged "to hold the product until we have more information," Charles recommended anyone seeking a refund call 888.314.2060 for details about how to get one. When I was a child my Mom typically made one kind of brownies. We only had a couple of cook books and 1 recipe box and I remember her recipe being on an index card in the metal box. It was made with a can of Hershey's chocolate syrup. When I was older, perhaps junior high, we always had Hershey's syrup on hand but since my Dad loved it on his ice cream it was never a 'new' can and never completely full (*smile*) which meant we found a new recipe for brownies. This one used cocoa powder and was used throughout my my time living at home before I moved out when I was 18. When I saw this recipe in my files I just smiled with the memory of our Hershey's brownies. These days I make my family's favorite brownies with a dark chocolate cake mix as it's starting base or with melted semi-sweet or unsweetened baking bars. But! I always keep recipes like this on hand to fall back on when I don't have baking squares on hand because really, brownies made in almost any form are perfectly delicious! Stir cocoa and baking soda in a bowl. Blend in oil. Add boiling water and stir just until blended. Add sugar, vanilla and eggs and mix by hand. Add the flour and salt, mix just until moist and pour into a 9x13 pan that you have only greased the bottom (not sides) of. Bake 35 minutes in a preheated 350 degree oven until the edges are firm but the center is just set. Do not over bake! This is why brownies get dry and hard. Better to undercook by a few minutes than to over cook! As a busy Mom of 3 teenagers and wife to 1 husband, our grocery bill has really taken a beating over the past year as the price of gas went up up up... and with it the cost of groceries. The frustration is when the price of gas went back down but the price of our food bill didn't follow! A package of boneless, skinless chicken breasts can set you back almost $10 and there are only 4 breasts in the package! That is another issue. 4 chicken breasts in a package with 5-6 people to feed. Last issue. If you are making a stuffed chicken breast recipe you need to pound the chicken out to make it thinner anyway because it's too thick to roll. The breasts are so thick that by slicing them lengthwise with a sharp knife you get 2 breasts from every one and end up with 8 servings instead of 4. These work wonderfully for stuffed chicken breasts or bundles, but also work excellent for making your 4 breasts feed 6-8 people when you bread them, bake them or grill them. With the addition of a side salad and a vegetable as well as a side of the ever affordable pasta you have a full, complete meal that will fill everyone up and you just saved money! At Christmas time I usually make the (very) traditional Wafer cookies, which are two cookies sandwiched together with a thin layer of creamy frosting. The recipe uses whipping cream and powdered sugar and has been around at least as long as my dear departed Great Grandmother had been alive. Land O'Lakes butter took Grandma's recipe and made the creamy center raspberry. As I'm on a huge raspberry craving right now this recipe jumped out at me to make... but another jumped higher. I'm saving this one for 'next time' and hope you will make it soon too! Combine flour, 3/4 cup butter and 2/3 cup powdered sugar in large mixer bowl. Beat at low speed, scraping bowl often, until crumbly (2 to 3 minutes). Gradually stir in 5 tablespoons whipping cream by hand. Roll out dough on lightly floured surface, one-third at a time (keeping remaining dough refrigerated), to 1/8-inch thickness. Cut with 1 1/2-inch cookie cutter. Dip 1 side of each cookie into sugar. Place 1 inch apart onto ungreased cookie sheets, sugared-side up. Bake for 7 to 9 minutes or until edges are lightly browned. Cool completely. Meanwhile, combine 1 1/2 cups powdered sugar, 2 tablespoons butter, 4 teaspoons whipping cream and raspberry syrup in small mixer bowl. Beat at medium speed until creamy (1 to 2 minutes). Spread scant teaspoonful filling on unsugared side of 1 cookie; top with second cookie. Squeeze together gently. Repeat with remaining cookies. * Substitute 3/4 teaspoon raspberry flavoring. Yields 4 dozen sandwich cookies. A few years ago, while visiting my parents in their small Midwestern hometown I stopped into a Mennonite store and bought a number of food products, including some tiny little caramel bites that were as small as little chocolate chips but had no chocolate. I also picked up some milk chocolate covered caramel balls. At the time no products like this were generally available in the United States grocery stores so when I had used them in brownies and cookies I couldn't find any more to take their place unless I would order from Canada. Thankfully those days are over and you can find products like this because the tiny bit of goodness they gave the brownies and cookies was just perfect and fun as well as being delicious! If you have some of these Teenie Poppers on hand you might want to substitute them for the chocolate chips in this simple chocolate chip cookie recipe. Enjoy! Cream the butter, eggs, molasses, vanilla and water in a bowl. Combine the dry ingredients and blend the two. Add the chocolate chips last. Shape into 1 inch balls and place them on a parchment lined baking sheet (or lightly greased). Flatten just slightly and bake at 375 for approximately 8 minutes until golden around the edges. When it comes to chicken breasts the possible recipes and dishes to make are almost endless. There is a reason there are a million cookbooks published that just have to do with poultry, and another reason that part of school and church cookbooks are so thick compared to the other categories. Chicken is one of those foods that you can turn into amazing meals in under 30 minutes. So, why is it that I regularly take out a package of boneless, skinless chicken breasts at 5:00 and stare at it while thinking; "What the heck do I do with you tonight?" Many of my chicken recipes start the same way - to saute or brown in butter/oil in a pan and then adding a liquid to the pan, some spices and using it as a sauce to go over the chicken and/or pasta. This one is no different... but yet, it is. It's a yummy mixture of red bell pepper and spinach in a creamy alfredo like sauce. Add it to your collection! And the next time you see that package of chicken breasts staring at you, check to see if you have the ingredients on hand to whip this one up. 4 boneless skinless chicken breast tenders or slice regular in half to make thin. Flatten chicken pieces and saute in large skillet in butter. When chicken is cooked, remove to warm plate. Add to skillet the chicken base, garlic, salt, pepper, oregano, garlic powder and juice of 1/2 lemon. Saute for 3 minutes. Add spinach and red pepper. Saute 3 minutes. Add white wine and bring to boil until reduced by 1/2. Add cream and return chicken to pan. Heat through. Serve with angel hair tossed with olive oil and freshly grated parmesan cheese. One of my favorite 'kinds' of foods are comfort foods. Nothing fancy and always made with things you have on hand it's something that 'Grandma' would make and probably did. In times of heartbreak, sadness, stress or loneliness a bowl or plate of a childhood food can bring a smile to your face. In our home it's no secret to my regular readers that we love cheese. In almost any way, shape or form, it's always in our house and usually in about 12 different versions or styles. One of the kids favorite foods is homemade macaroni and cheese. Beating any store version by leaps and bounds it's the perfect dish for your own family or to bring to a new family that just moved in (child friendly and mother approved!) or to a family member or friend that you know could use a little cheering up. The secret to a thick, smooth and creamy macaroni and cheese is of course... the cheese. Using Velveeta is the secret many cooks already know and many wish they knew! I personally love to use cream cheese in most of my cooking so I obviously throw some in here too. You don't have to if you don't have it or don't like it but a cheese sauce made from cream cheese, velveeta and a handful of other mixed cheeses is just this side of heaven on on earth. In a saucepan over medium low heat melt the butter with the milk, 1 1/2 c grated cheddar cheese, a 4 oz. chunk of Velveeta, cubed and about 3-4 oz cream cheese, cubed. When smooth and melted (don't cook at higher heat or too fast or the bottom will scorch) pour over the macaroni and stir. At first it might be thin (see photo to left) but as it sits for a few minutes the Velveeta and cream cheese thicken it up. Salt and pepper to taste. Yum! In our home we don't eat what I imagine a lot of typical Americans snack on. We don't usually snack on chips or cookies. The number one snack in our home seems to be cheese and crackers and coming in a close second, vegetables and dip or crackers in dip. Like most of my recipes, I don't usually measure. I open the cupboard and throw whatever looks good at the moment into a bowl, mash it together or whip it (depending on the base) and serve. Dips are like that though - they usually are pretty good no matter what you add. (Ok, within reason! Ha). Although some would disagree with me because they like mayonnaise based dips with their crackers, I find that if I'm serving a dip with vegetables I use a mayonnaise base. Chips? Sour cream base. Crackers? Cream cheese base. The spices are similar but the base changes the flavor and texture. This is a very basic, simple dip recipe to use for carrots, celery, pepper strips, broccoli and cauliflower. Enjoy. Although I don't take part in any cooking contests, nor am I sponsored or being reimbursed for this post, I got this in my email and thought I'd pass it on to any of my readers interested in taking part in the 15th Annual Crisco National Pie Championships. I know nothing about the contest, since I don't take part and never plan to - but thought I'd pass along the information from my email box. The American Pie Council and Crisco® seek junior, amateur, professional and commercial bakers to compete in more than 25 pie flavor categories for the National Pie Championships. Prizes to include Sears Kenmore ranges, Chef Depot gift certificates, Crisco® gift baskets, cash awards, and most importantly bragging rights as the best pie maker in the nation. April 24-26, 2009. Ramada Orlando Celebration Resort and Convention Center, Kissimmee, Fla, 34747. 2009 THE GREAT AMERICAN PIE FESTIVAL, sponsored by Crisco® and the American Pie Council, featuring all-you-can-eat 55,000 slice Never Ending Pie Buffet, pie baking competition, cooking demonstrations, pie eating contest, games, music, "PIecasso" crafts and other pie-related festivities. Sat., April 25, 11 am - 7 pm, and Sun., April 26, noon to 5 pm. Lakeside Park at 631 Sycamore St. in downtown Celebration, Florida 34747. Festival is free to the public. Never Ending Pie Buffet is $10 for Adults, $5 for Seniors 65 plus and for children ages 6 to 12, children under age 6 are free. (407) 566-2200, www.piecouncil.org. You don't have to eat beans and rice to save money, you just have to be smart! This recipe is a smart one. Affordable at the basic level with a pound of ground beef, a few cans of beans and tomato products and an onion and bit of pepper, it's still affordable made with leftovers too. You'll see what I mean in a minute because here is the important thing about this recipe: CHANGE IT. Your family doesn't like green peppers? Leave them out. Love garlic? Add more. Got some extra leftover steak to use up? Do it! Dice it and add it immediately! This chili is the best with leftover grilled sirloin or rib-eye! (*remember I always tell my readers to SAVE leftovers! That's what your freezer is for and you can always use them in soups and stews later on!). This is a basic recipe I made up back in 1996 when my kids were little and I had to spice to a minimum. Today's chili looks only vaguely similar to this recipe as I added 1 pound of ground beef, 1 pound of leftover steak, diced, 2 diced pork chops, about 2 T minced garlic, no crushed tomatoes, a quart of homemade tomato juice in its place and no tomato sauce, but added a can of diced tomatoes instead. I also threw in a dash of worcestershire sauce just for the heck of it. Play with the recipe, add and delete... make it yours! Brown the ground beef with the onions and peppers. Add the garlic and the rest of the ingredients. Bring to a boil then turn down and simmer slowly for as little as 20 minutes or as long as a few hours. You can also let it cool, refrigerate it and reheat it the next day - which many people say is the best. I don't know what it is about this past week but I simply cannot get enough... vegetables!!! Even though it's the middle of winter when my body normally craves hot, filling dishes that go perfectly with the cold, snow filled days, instead I'm finding myself craving salads and vegetables. Cold and fresh! This week there have been two afternoons where I couldn't even wait for dinner and had to make a huge green salad with fresh homemade Italian dressing. And then when it was gone I had to make a second! It was all I was craving... fresh greens, cucumbers, onions, peppers and radishes. When I was standing in the vegetable department of the grocery store last week I was debating buying squash. All I could think about was how good they are sliced thick, drizzled with olive oil and seasoned and grilled, but with the ice storms and -35 degree temperatures we've been having at night I don't think grilling is in our immediate future. I didn't even think (at the time) about making a simple salad out of it. But... now I am. So my next trip? Squash will be purchased! Prepare marinade by combining the first nine (9) ingredients in a jar. Clean squash and place, whole, in a saucepan. Cover with boiling water and add salt. Cook 6 minutes or until still crisp but just barely tender. Immerse in ice water to stop the cooking process and drain well. Slice squash into a bowl, pour marinade over squash and refrigerate 4 to 6 hours or overnight, stirring often. When ready to serve, slice fresh tomatoes in wedges and a wedge of lettuce. Drizzle marinade over all. In our home a simple 'do it yourself' dinner or lunch frequently involves the humble quesadilla. Especially if it happens to be my 7th grade daughter choosing what she wants to eat. Although it's easy to put some cheese into a flour tortilla and microwave it for a minute and call it 'good enough' there is something special about making them similar to the way they are served in restaurants. They only take about 2 minutes more to do, but the end result is somehow more satisfying. If you have a George Foreman grill go ahead and use that because then you won't have to 'flip' it, but if you don't, just grab a frypan and let's get started! The possibilities are endless with this simple 'starter' recipe. Heat the skillet or fry pan over medium high heat. Butter one side of the flour tortilla and place it in the pan, immediately sprinkling the cheese on it. Top with another buttered flour tortilla, with the butter side up. As soon as the bottom tortilla is golden and the cheese starts to melt, carefully and quickly flip it. When it's golden, place it on a serving plate, cut into quarters and serve with a side of fresh salsa and/or sour cream or guacamole. *Use a variety or mixture of cheeses! Cheddar is great, but a mixture of 2 or 3 is delicious! Any cheese will do. *Add a sprinkle of chopped green onions, peppers, jalapeno's or even bacon. Use your creativity and imagination! When I say "I'm so vanilla" I'm not just talking about my taste in life... I'm actually talking about food interests as well! Vanilla ice cream, vanilla custard, vanilla (white) cake, vanilla frosting... Just this week I painstakingly cut off every single tiny smear of chocolate from a slice of Dairy Queen ice cream cake so there wasn't a bit of chocolate to mar my delicious vanilla-ness. My husband stood and watched me like I was insane. But it's true, even the tiniest smudge of chocolate ruins a good vanilla, well, anything! Preheat your oven to 325 degrees. In a medium saucepan, combine the milk and vanilla beans and bring to a bare simmer over high heat. Remove the pan from the heat, cover and let the mixture steep for 15 minutes. In a medium bowl, whisk the egg yolks with the sugar until thick and pale. Bring the milk back to a simmer and whisk it into the egg yolks in a thin stream (drizzle) so as to not curdle or cook the eggs. Strain the custard through a fine sieve set over a bowl. Let stand for 2 to 3 minutes, then skim off the foam. Use either one large stonewear or ramekin style dish or 8 individual ramekins. Place it or them inside a larger baking pan. Fill the ramekins three-quarters full with the custard. *Pour hot water into the baking pan to reach about halfway up the sides of the ramekins or casserole dish*. Cover the baking pan loosely with aluminum foil and bake for 30 to 35 minutes, or until the custard is just set at the edge but still trembling in the center. Remove the baking pan from the oven. Carefully lift the casserole or ramekins out of the pan and let cool at room temperature. Cover loosely and refrigerate, for at least 2 hours or up to 48. Serve chilled and you can dollop a small spoon of fresh whipped cream on top and even sprinkle a tiny bit of cinnamon if you'd like. is "What to cook?" each blessed day! I'm not sure what all the corresponding factors might be but when we moved here four years ago it coincided with my enthusiasm waving for cooking big meals each night. I suspect it was a mixture of a move to a kitchen that never was 'just right' to me, (the drawers aren't deep enough, there is no storage space and nothing felt 'right' about the layout) and I also returned to the workforce to help out with the family bills. With the kids being starting high school our schedules went from merely crazy to simply insane and well... therein lies the answer I think. So today after arriving home from work an hour late, I looked in the refrigerator and the little prose that I typed above came to mind... 'what to cook each blessed day......' Well, today is pork chops. And not in the mood for making a huge dinner out them I opted for a simple breading. Here is where my regular readers will be thankful I've preached to them to always, always save 'extra' bread. The heels of loaves, day old bread you know you won't eat. The last bun in the package. The bruschetta and baguettes left over from Thanksgiving... get them out of the freezer and run them through your food processor! Lay each pork chop into the breading mixture and press the mixture into the chop to seal. I flip mine two or three times and press firmly. Place in a pan (I like to line my pans with foil for easy clean up) and either spray heavily with cooking spray or add about 2-3 T oil of your choice. I like to use the oil because it forms a nice crust on the pork chops. Here they are, ready for the oven! Bake at 400 degree's for approximately 35 minutes or until done in the centers. Serve with your favorite side dish. I served them tonight with cooked cauliflower and baby carrots with a simple 4-cheese sauce. Enjoy! *can be used on chicken breasts too!! For our family the holidays are officially over. No more family Christmas's to celebrate (some do in January do to busy schedules), all the family birthdays are also now behind us and it's time to start a new year! One of the items I've been wanting to make over the past two months but just have been too busy is a Crepe Cake or a 20 Layer Cake. Somewhere in my computer files is a picture I wanted to post but I have no time this morning before having to get ready for work so instead I had to do an internet search for a basic photo and thank G**gle for this one. I wanted to give you a general idea however, of the thin layer cake I'm talking about. In the meantime I've collected about 5 or 6 different recipes for crepe cakes and I'm going to do as I always do... mix and mash the recipes as I feel to make my own version. This is one that I found and tucked into my files about 1 1/2 years ago. I like the simplicity of the store bought ingredients and packaged ingredients however I would not use the Nutella spread. I am posting it here for future reference for myself and of course you are free to try it as well! Beat cream cheese, mascarpone, pudding mix, 3/4 cup milk and almond extract until smooth. Place a crepe on cake stand and spread a thin layer of custard over the entire crepe. Continue to layer crepes and thin custard layers. The 20th crepe will be the last layer. Place cake in refrigerator at least 1 hour before serving to allow custard to set up. Just before serving, mix container of Nutella with 1/4 cup milk in a small microwave-safe bowl. Microwave until smooth, stirring as needed. Slice cake with a large serrated knife to provide a clean cut. Place each slice on a plate and drizzle nutella mixture on top.